This title was first published in 2001: Although 17th- and 18th-century English language theorists claimed to be correcting errors in grammar and preserving the language from corruption, this new study demonstrates how grammar served as an important cultural battlefield where social issues were contested. 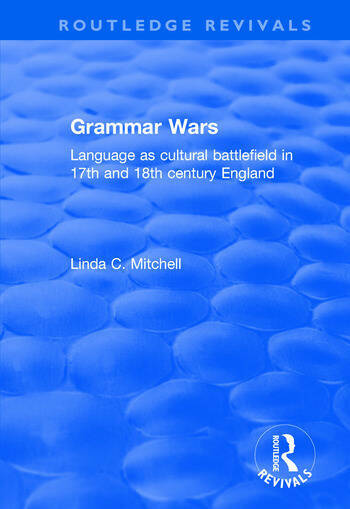 Author Linda C. Mitchell situates early modern linguistic discussions, long thought to be of little interest, in their larger cultural and social setting to show the startling degree to which grammar affected, and was affected by, such factors as class and gender. In her examination of the controversies that surrounded the teaching and study of grammar in this period, Mitchell looks especially at changing definitions and standardization of "grammar", how and to whom it was taught, and how grammar marked the social position of marginal groups. Her comprehensive study of the contexts in which grammar was intended or thought to function is based on her analysis of the ancillary materials - prefaces, introductions, forewords, statements of intent, organization of materials, surrounding materials, and manifestos of pedagogy, philosophy, and social or political goals - of more than 300 grammar texts of the time. The book is intended as a landmark study of an important movement in the foundation of the modern world.